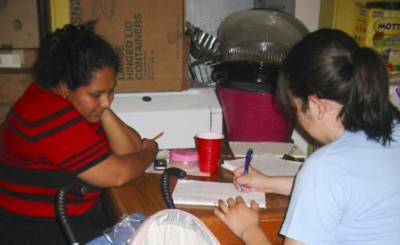 Ignacia Cruz is a math tutor at Time Dollar community center in West San Antonio. Through a community project, Cruz learned to strengthen her math skills in order to help her own children with elementary-level math despite having a GED. But the program at Time Dollar shuttered after funding ran out 10 years ago. Thanks to Northwest Vista College receiving a $3.7 million grant from the U.S. Department of Education, Time Dollar can now help parents once again with their math skills. Since the Time Dollar and NVC partnership, faculty have hit the ground running to make an impact. So far, already nine parents have signed up to get math training. 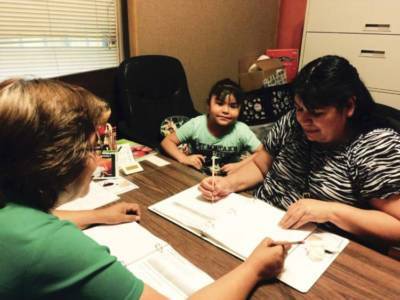 NVC’s Heidi Hunt, Ed.D, co-principal investigator for the grant, said she began working with Ignacia to see where her math skills are now, and to give her materials to help her work with the new moms. The pre-work has included reaching out to moms with pre-schoolers at Time Dollar, securing HEB gift cards (with the help of Lynne Dean) to give to the moms if they take a math pretest, and developing the test with the grant’s UTSA partners. In addition to Heidi, Anna Harwin and Julie Pace are also leading the grant project. Teaching math to mothers originally started 10 years ago by Alexandra Harwin, a Stanford student investigating the relationship between college math readiness and parental support. The results of that study indicated if a Latino parent could support their elementary student, down the road that child would likely be more ready for college. While teaching math skills at Time Dollar, Alexandra noticed that when mothers learned basic math and algebra skills, their children’s math skills improved significantly. Mothers were taught various ways to teach their children math. This method proved highly successful, and teachers began to see students’ math grades improve. Studies show that only 29 percent of Hispanic college graduates are meeting college-level readiness for math. The absence of a solid mathematics foundation results in lost educational and career opportunities in STEM and other math-intensive career fields. Time Dollar Director Silbia Esparza says she has seen first-hand how the program works. “I found that mothers who reached just an algebra-level math competency later became math educators themselves and went on to teach their peers math from the community math project,” Silbia said. The main purpose of the grant is to train aspiring teachers from NVC that transfer into UTSA skills that will help them increase their own math confidence. The prospective teachers, called “Math Fellows” will work in the community centers where NVC has its math programs. One of the goals for Math Fellows is to better understand the complex issues that underserved families may face, such as poverty and inequity. Northwest Vista President Dr. Ric Baser says the journey to make lasting changes in the community began years ago for NVC, and it is one he is proud to continue.